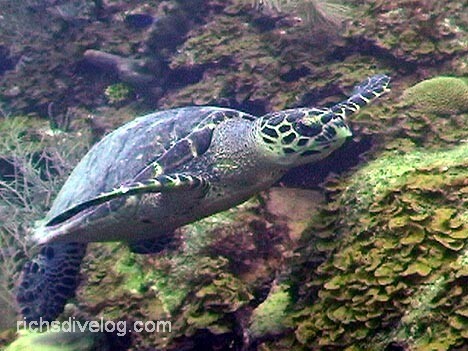 This turtle is from a previous BVI dive. Dive Journal: This morning we sail further east and settle in the channel between Ginger Island and Fallen Jerusalem. There is a smaller island there called simply Round Rock. There is a decent current here, and we’re doing a drift dive. "Grovel and Fly" is a great name for this dive. We descend into the channel and do a very quick descent into about 50 feet of water. Large rocks protrude from the bottom, and we explore the down-current side of each of them, hovering in the back currents. This is the “grovel”. We then let go from the protection and “fly” on the currents to the next big rock or overhang, tucking in behind it. What a blast. There are tons of holes and shelves to explore. We find 2 incredibly huge Caribbean spiny lobsters – I’m figuring the currents supply them with plenty of food so they can grow large here. Then, down in a couple of grotto-like features are two of the largest nurse sharks I have ever seen. Fellow diver Mark Cushman and I peer down into the depression for a while until one of the sharks finally comes swimming out, and right at Mark, pretty much unnerving us both. Last dive off the Cuan Law this year. We completed 13 dives in 6 days, a leisurely schedule that suits us perfectly. After so many years of carefully managed operation, the Cuan Law has its operations and pace perfectly tuned. and the four of us from Arizona.